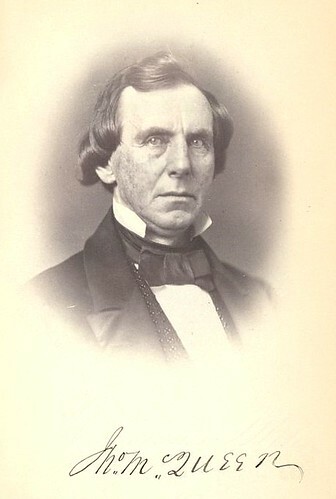 John McQueen, US representative and secession commissioner from South Carolina, addressed the Texas secession convention on February 1, 1861. McQueen was in the state militia in the 1830s, which is the only reason I can think of that he has the title “General” in this document. Mr. President and Gentlemen of the Convention. I have been honored with a commission by the Convention of the State of South Carolina to repair to your State and lay before your Convention an ordinance of the State of South Carolina, by which she seceded from the confederacy and dissolved all connection with the federal government of the United States. And also to tender to you the sincere sympathy of the people of South Carolina in the great and momentous movement in which we are all engaged, and in which our interests are identical and our honor is alike involved. I am also instructed respectfully to suggest to you, in the event of your secession to cooperate with us and other seceding Southern States in the formation of a confederacy in which the constitution of the United States is to be taken as a basis, and that you send delegates to a convention to be held at Montgomery in the State of Alabama, on the 4th day of this month to establish a government for such seceding States. Having thus been honored by your body with an opportunity of discharging the special objects of my mission, I shall not presume to trespass upon your patience with any suggestions of mine as to your duty to your State. Indeed, had I no scruples upon the propriety of doing so, I should certainly decline it being too well satisfied that the honor and interests of Texas are much more secure in your own hands. But I trust I may not be intrusive if I refer for a moment to the circumstances which prompted South Carolina in the act of her own immediate secession, in which some have charged a want of courtesy and respect for her Southern sister States. She had not been disturbed by discord or conflict in the recent canvass for president or vice-president of the United States. She had waited for the result in the calm apprehension that the Black Republican party would succeed. She had, within a year, invited her sister Southern States to a conference with her on our mutual impending danger. Her legislature was called in extra session to cast her vote for president and vice-president, through electors, of the United States and before they adjourned the telegraphic wires conveyed the intelligence that Lincoln was elected by a sectional vote, whose platform was that of the Black Republican party and whose policy was to be the abolition of slavery upon this continent and the elevation of our own slaves to an equality with ourselves and our children, and coupled with all this was the fact that, from our friends in our sister Southern States, we were urged in the most earnest terms to secede at once, and prepared as we were, with not a dissenting voice in the State, South Carolina struck the blow and we are now satisfied that none have struck too soon, for when We are now threatened with the sword and the bayonet by a Democratic administration for the exercise of this high and inalienable right, what might we meet under the dominion of such a party and such a president as Lincoln and his minions. It is from under such dominion that South Carolina respectfully invites you to unite in forming a government with a homogeneous people, identical in interest with you, and whose effort it will be to perpetuate the institutions of our fathers. We are not unmindful of your illustrious history when fresh from the fields of victory and glory in which you established your own independence you presented a spectacle unexampled in the history of the world. With a territory sufficiently extensive for empires, with a soil rich in the production of everything necessary for the happiness of man, and with a climate as lovely as can be found on any spot of the habitable globe, without money and without price, you united your destiny with a sisterhood, whose duty it was to foster and protect you, and yet from our common enemy you received in return but neglect and insult, and even arson and poison, that your hearthstones might be violated and your wives and little ones tortured and murdered. In conclusion I will simply add that it is a source of highest gratification to me, from what I have witnessed since I have been with you, and the intelligence and spirit in your honorable body, to be able to report on my return to South Carolina, and on the wayside, through six now independent, sovereign, Southern States, that your own noble State of Texas, in her own way, and at her own time will very soon be added to their number, and ready to unite with them in a Southern Confederacy, to perpetuate the institutions of our ancestry, who transmitted them to us, that we should have in them but an usufruct, and transmit them, untarnished, to our posterity. Allow me again Mr. President and Gentlemen of the Convention, to tender you my sincere thanks and gratitude for the honor you have bestowed upon me, and the kindness you have extended to me both publicly and privately since I have had the pleasure of associating with you and to assure you that they will most kindly be remembered by me and I am sure appreciated by the State I represent. I’m not going to beat a dead horse here — the cause for secession is clear. As you’ll no doubt read elsewhere in more detail, the Texas convention voted to secede later that day. This entry was posted in Causes of the war, John McQueen, Secession, South Carolina, Texas. Bookmark the permalink.